Is this painting telling the truth? Some times things are not what they seem. Every visitor who looks at this painting on the walls of the Florence Griswold Museum would reasonably believe that this painting by George Henry Durrie is based on an actual yellow house on a small farm located seven miles away from Farmington. After all, Seven Miles to Farmington is its title, and that’s what the artist wanted you to believe. But mysteries about this painting lurk everywhere. To discover those mysteries and uncover some of your own, we invite you to join us in this online learning portal SEE/change which challenges students to change the way they SEE paintings. Let’s get started. This prototype for an online learning resource for Connecticut teachers and students in grades 3-5 is the outcome of the the Museum’s yearlong (2017) project focusing on Seven Miles to Farmington by Connecticut artist George H. Durrie (1820-1863). Click here to see the roster of participants on our Project Team. Inspired by the new Connecticut Social Studies Frameworks SEE/change investigates the potential of using a painting as a primary document of the past to help teachers and students learn about Connecticut history. Few artists shaped the popular image of New England more than George H. Durrie. 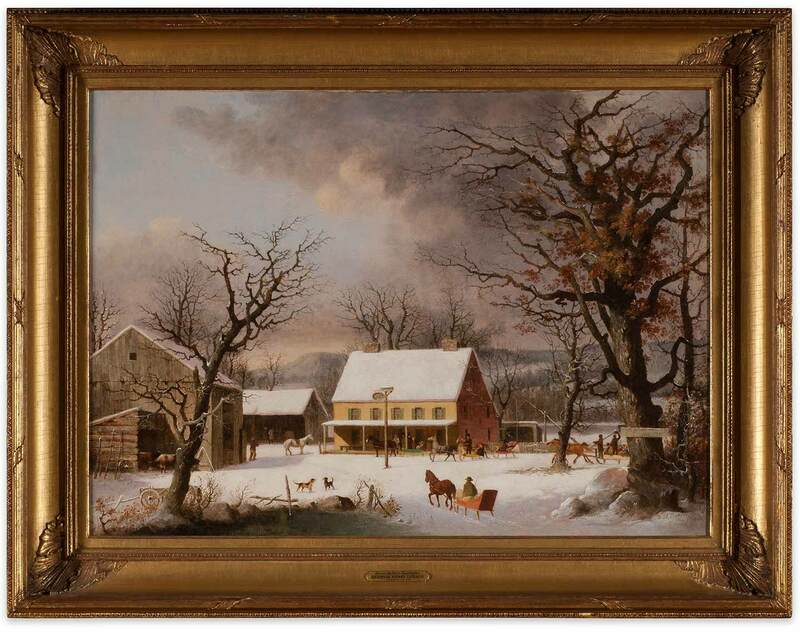 Durrie’s Connecticut landscapes were reproduced and distributed as prints by the firm of Currier and Ives beginning in the 1850s. Painted in an era when railroads were becoming the dominant mode of travel, Seven Miles to Farmington, which exists in several versions, both documents and encourages nostalgia for the country tavern as a cheery wayside social center. Rather than depicting rural homesteads in their original settings, Durrie often selected elements to create idyllic composites. At the time, the artist’s detailed observations of rural life provide insight into the world of their creation. Durrie attends to every nuance of the inn and its agricultural outbuildings, barns for animals and provisions, to wellsweep, and the residence. His depiction of horse-drawn sleighs of varying types suggests the modes of transportation used not only for work, but also leisure of the sort enjoyed by the festive party in the background. Durrie’s rendering of both people and place prompts questions about the atmosphere and amenities at country inns and the types of people who staffed and visited them. As in many of his landscapes, the artist coats the scene with snow, encouraging viewers to consider adaptations to weather and the role of the passing seasons in New England country life.